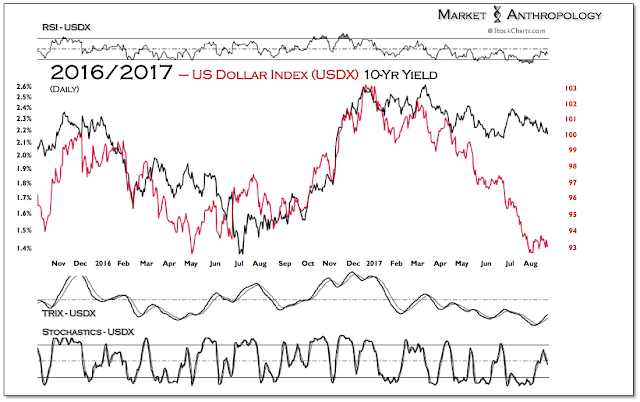 With traders setting their sights and ears to what Fed Chairwoman Yellen and ECB President Draghi might say or exclude in their respective Jackson Hole speeches tomorrow, the US dollar index – primarily influenced by the exchange rate of the world’s two largest reserve currencies – has made its way back down to long-term support after consolidating the steep move lower that began at the start of the year. 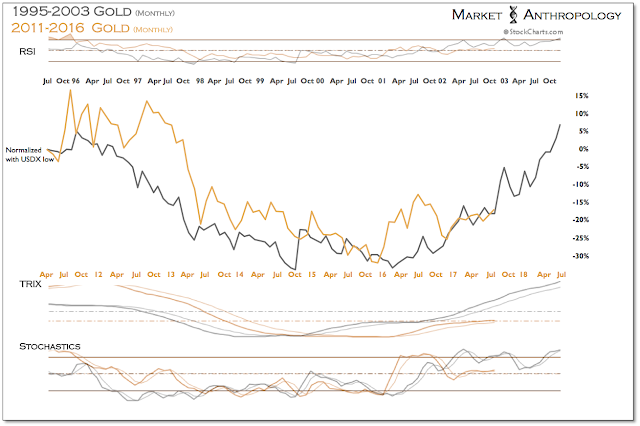 As the July inflation data was largely uneventful, another window has opened over the next few weeks to break the respective ranges in gold (up) and the dollar (down). 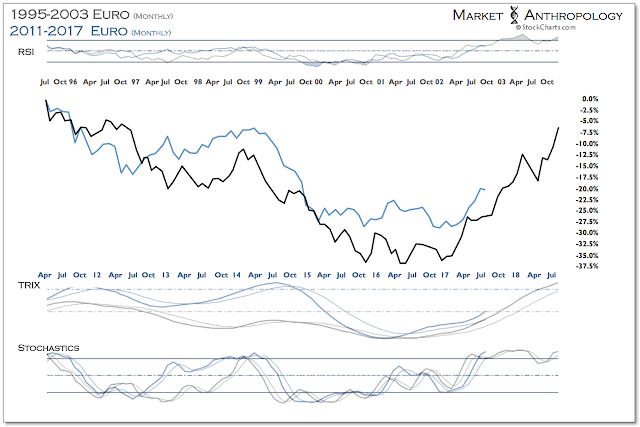 Over the near-term we wouldn’t be surprised if the markets took a slightly more hawkish tone subsequent to Yellen and Draghi’s speeches tomorrow, if only because the palpable dovish leanings going in may not be further nurtured. At the end of the day, Yellen knows it’s easier to walk back policy expectations than to ratchet them up. 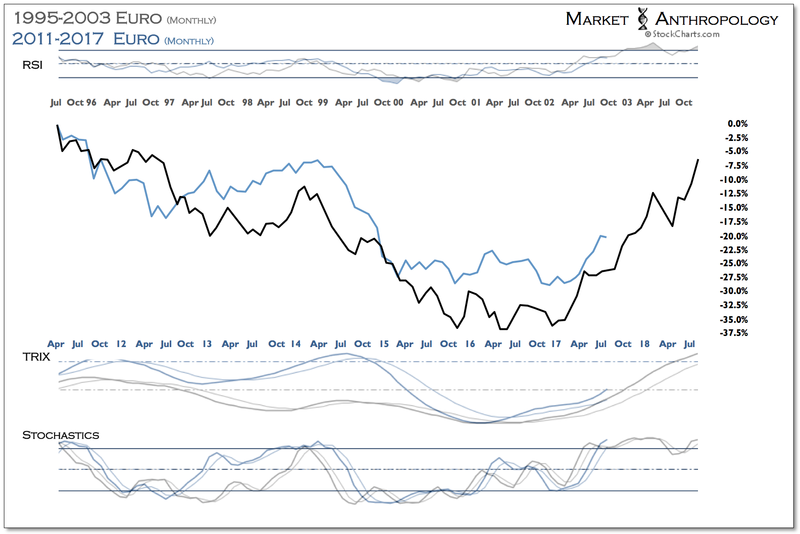 In the absence of new data or an exogenous influence, we would speculate the symposium is largely a non-event, where a relatively tighter ECB is counterbalanced by a less hawkish Fed. That said, the elephant(s) in the room remains the contentious relationship between the President and his own party, as the very real threat of a government shut-down and debt default greatly threatens the last remaining prize of the President's legislative agenda this year: an overhaul of the nations tax system. 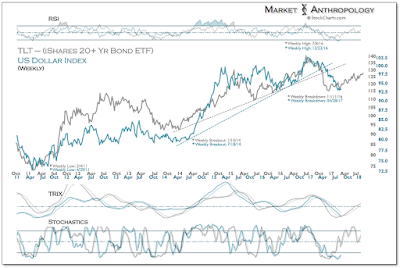 Naturally, as the legislative deadline approaches this fall these tensions should come to a head. 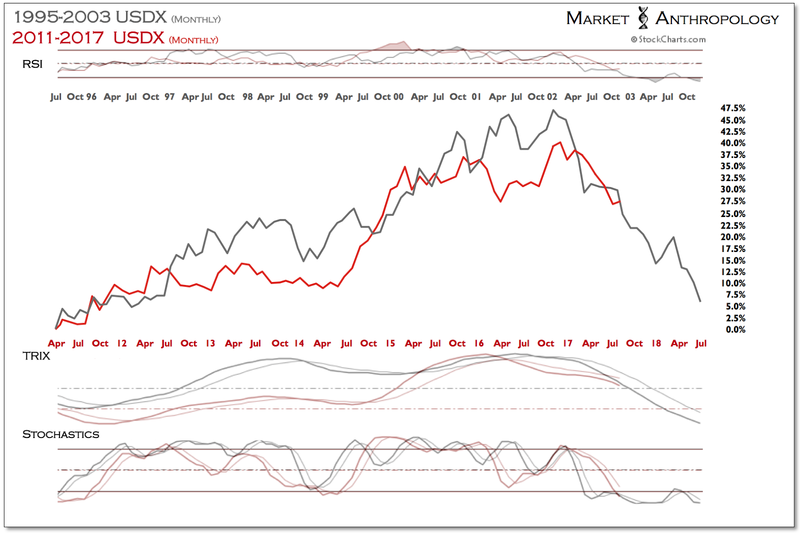 Generally speaking, from a basic technical perspective the downtrend in the US dollar index this year has been defined by characteristic “lower lows” and “lower highs”, typical of a significant momentum unwind with diminishing relative strength imprints as the move unfurls. Overall, we expect the pattern to continue as underlying long-term support is eventually breached, which should register positive relative strength divergences before a more tradable low is reached. 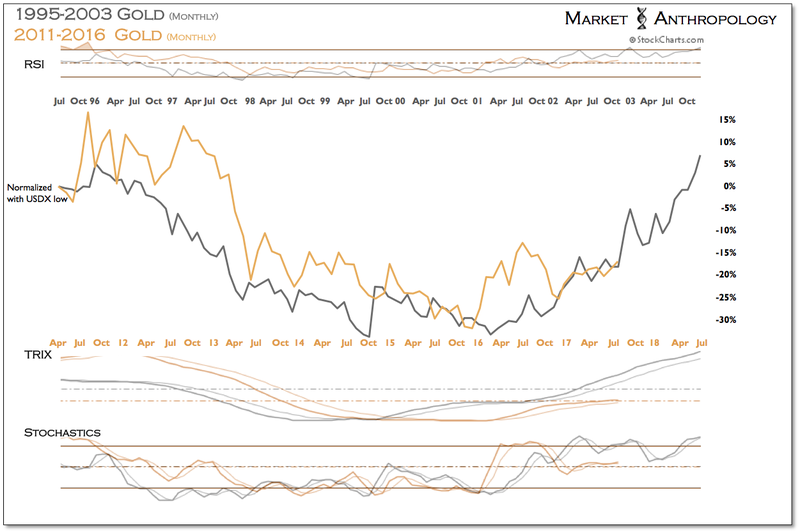 Among the few touchstones we’ve benchmarked against this year to estimate the dollar’s prospective trend, we’ve contrasted the breakdown in gold in 2013, which also displayed a diminishing momentum signature as it broke underlying support from its broad top range. 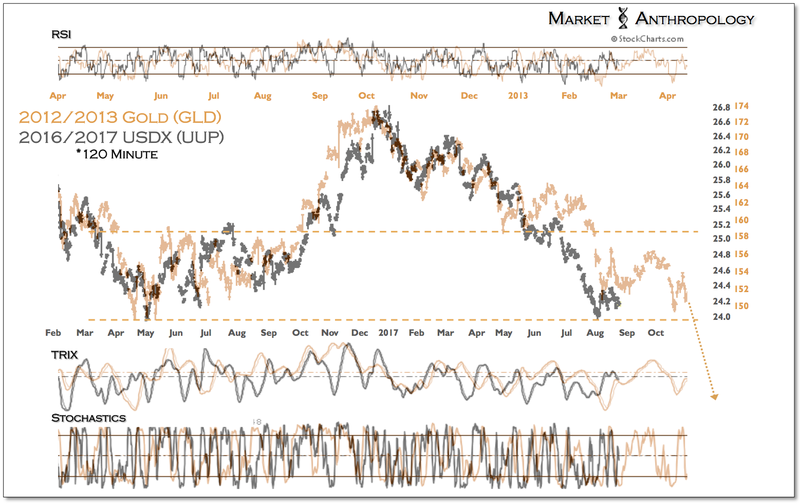 Notwithstanding our appreciation of the inverse symmetry to the cycle today – in which gold has been rejuvenated as the dollar weakens, the technical similarities have remained prescient for the dollar index as well. 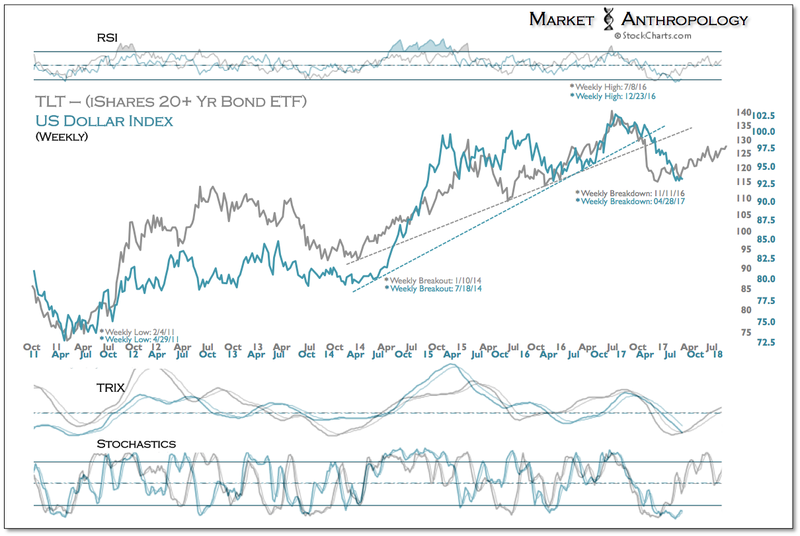 Since utilizing at the start of the year our intermarket leading comparative with long-term Treasuries that accurately pointed towards where the dollar would loose trend line support in April (see Here), we have also contrasted with the cyclical pivot in the dollar in 2002 for more long-term projections – as well as a prospective road map for long-term yields, the euro and gold. Our interpretation at the end of Q1 (see Here) was that the dollar was set to follow Treasuries breakdown lead with the last lagged pivot (~5-6 months) of the cycle, which should mark a pattern break (between LT Treasuries and the USDX) as the dollar turns cyclically lower without a corresponding leading move in Treasuries. 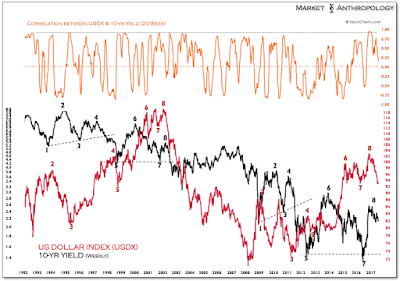 In hindsight, those expectations appear well founded to-date, as the dollar and long-term yields have behaved quite similar to their respective breakdowns in 2002, where long-term yields reached a positive correlation extreme with the dollar and turned down again with the dollar's cyclical pivot. 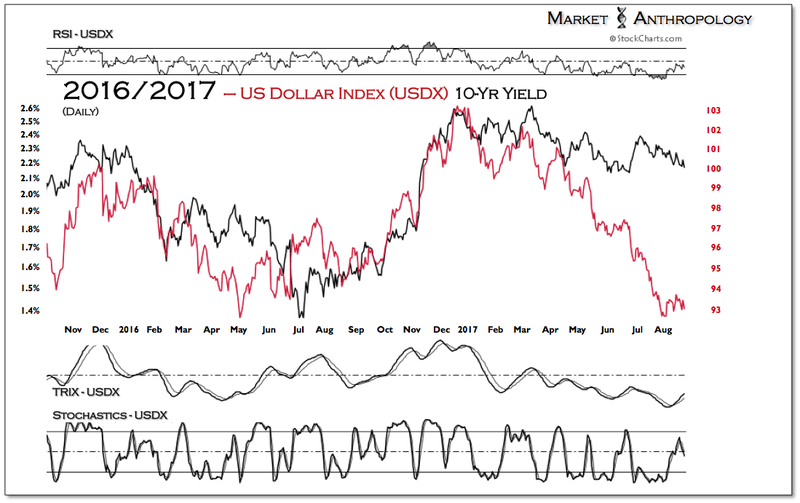 From a big-picture cyclical perspective, we’ve pointed out in the past that the dollar has followed major upside exhaustion extremes in long-term yields by 2 to 3 years. The 9/81’ secular high in yields was followed by a secular high in the US dollar index in 2/85’ (monthly). The upside exhaustion in yields in 1/00’ was followed by the cyclical high in the dollar index in 1/02’. 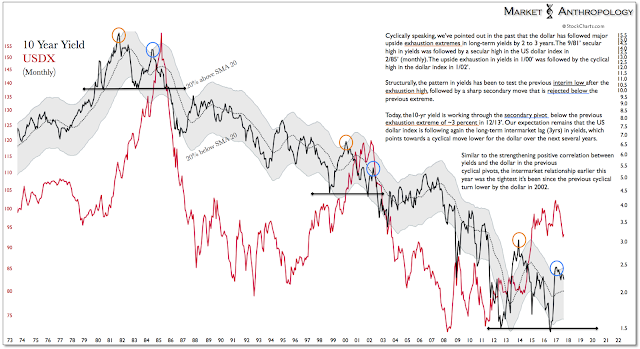 Today, the 10-year yield has worked through the secondary pivot below the previous exhaustion extreme of ~3 percent in 12/13’. 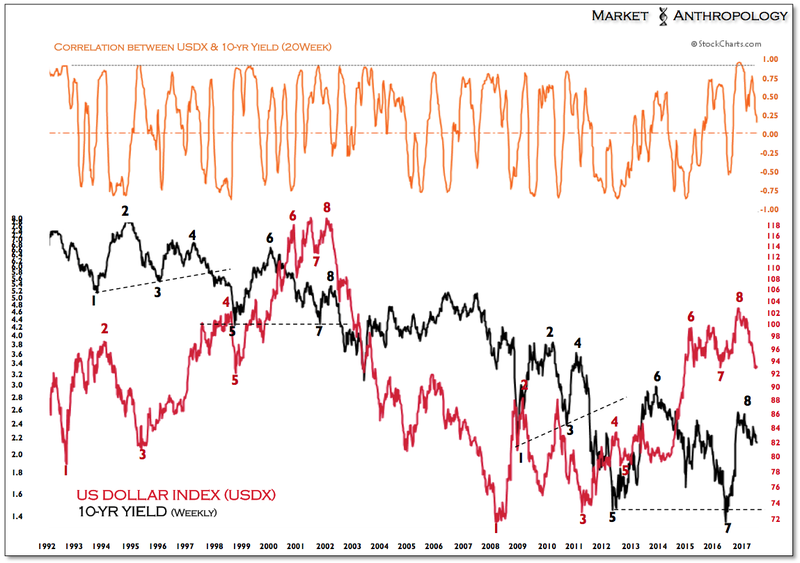 Our expectation remains that the US dollar index is following again the long cyclical intermarket lag (3yrs) in yields, which points towards a continuation move lower for the dollar over the next several years. 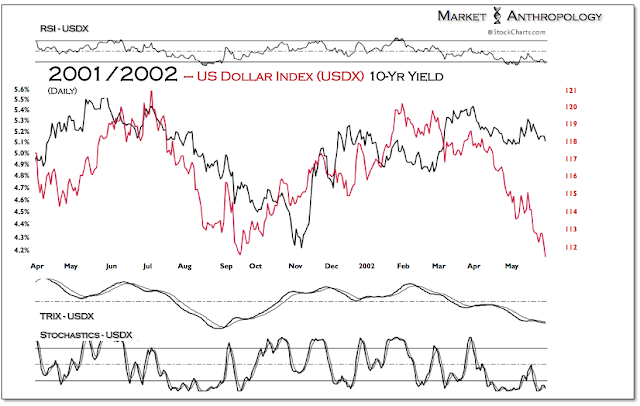 Similar to how the US dollar index led the subsequent breakdown in yields in the back half of 2002, a fresh break of long-term support in the dollar could bring a retest of long-term yields lows from last summer.